Hike the Bright Angel Trail as far down as your abilities allow. There are rest areas at the 1.5 mile and 3.0 mile mark. Coming back up takes twice as long as going down, so pace yourself. Be sure to bring lots of water if hot. Be sure to allow enough time to return to the rim before 11 am in the summer time. 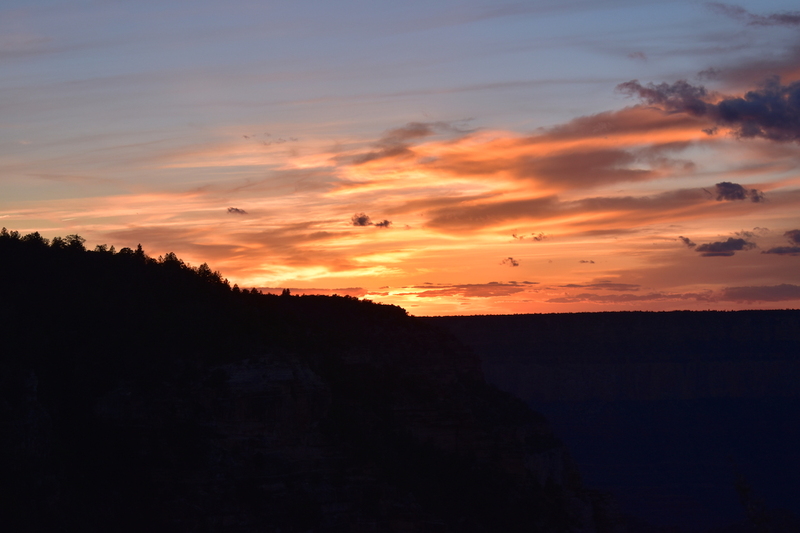 If you have a second day, head to the North Rim and drive the Cape Royal road, stop for scenic views along the way. The drive from the South Rim is 210 miles. Consider staying near the North Rim overnight. 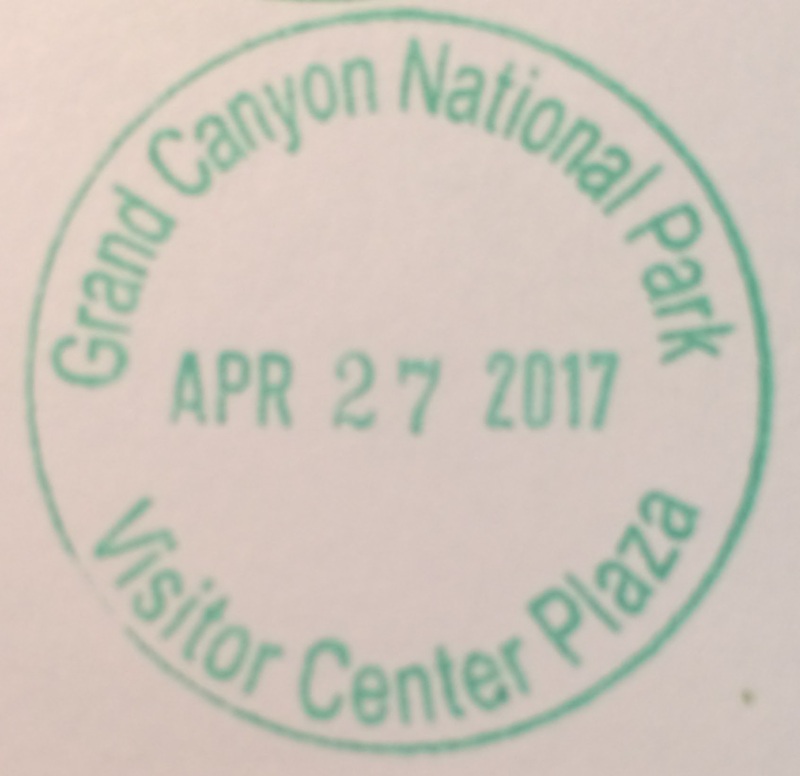 There are two distinct types of people who visit National Parks. Grand Canyon National Park has both in abundance. What are the telltale signs? Theme Park People: Arrive by bus, wear flip-flops, sandals, crocs, or dress shoes, loud talkers, do not stray more than a mile from the car / bus, hurry to viewpoints as if it will disappear if they are slow. National Park People: Wear hiking boots and hats, use hiking poles, quietly and leisurely appreciate scenery, says hello to everyone they pass on the trail, hike trails of more than 2 miles. Grand Canyon National Park attracts a lot of people, but only five percent of the people leave the rim and venture into the canyon. Most people who hike any distance into the canyon are “National Park People”, although you will find “Theme Park People” within the first half mile of popular trails like the Bright Angel trail. We arrived at the South Rim late in the afternoon and went right to the canyon rim. We ignored the warning of full parking lots because it was late in the day and sure enough, there were plenty of parking. The parking lot full sign was a hint of what to expect tomorrow. This was not even peak season and yet there were lots of people even late in the day. We went right to the viewpoint behind the visitor center – Mather Point. Even though this was the third time I’ve been to the Grand Canyon, the first view still took my breath away. It’s GRAND. Deep, wide, colorful. It didn’t look real! There was a haze hovering the canyon. Everything was fuzzy in the late afternoon light when sun and clouds played hide and seek. I wanted to test the time lapse photography feature on my new camera, and there was no better place to do it than the Grand Canyon. 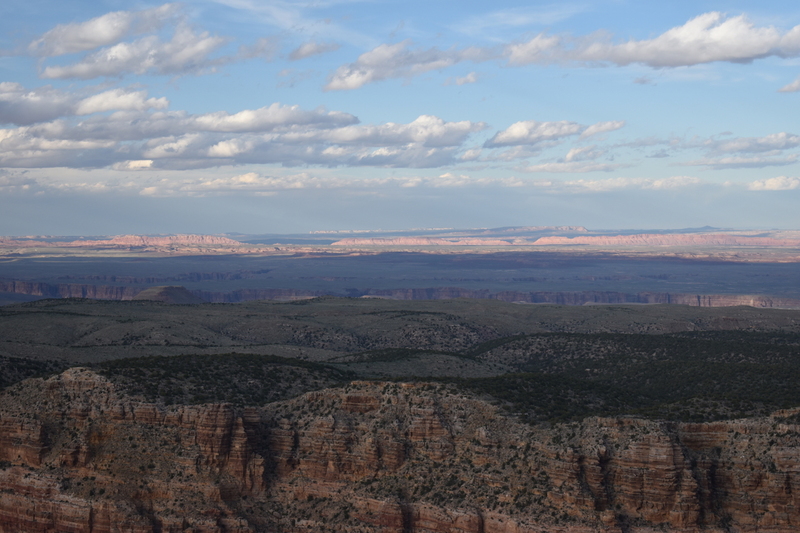 We found a place at the rim and pointed the camera east as the canyon reflected the setting sun. The wind was howling and temperature dropped into the 40s. I had to hang my backpack under the tripod to prevent it from being blown into the canyon. I started the time lapse for 20 minutes and waited as the camera dutifully snapped a picture every five seconds. The longer I waited, the colder it got. Loretta hid behind a bush and muttered to herself “Why did I agree to this?” But she was a good sport and endured the wind and the cold. 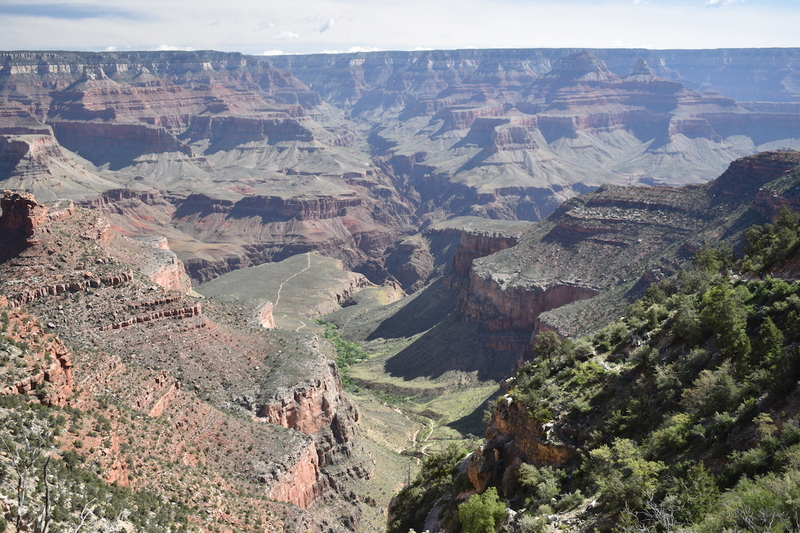 The grandness of the canyon – more than a mile deep and 14 miles wide made it remote and impersonal. The canyon is deeper and wider than other canyons in US National Parks. The colors are vibrant, with shades of red, green, blue and white, and changed constantly as the sun made its arc across the sky. The canyon is tiered with the Colorado River playing hide and seek when viewed from the various viewpoints. Access to the south rim is on highway 64 which travels through a boring high plateau that seemed to be flat as a pancake. All of the sudden, with no warning, a huge crack in the earth presented itself. The transition is dramatic. Bright Angel Trail is world famous. We set out first thing in the morning and joined a steady stream of hikers down the trail, crossing with hikers coming up the trail from an overnight stay at Indian Garden. The trail was only four feet wide and we often have to wait for people to pass. I haven’t seen this many people hiking a particular trail in any other National Park. I always say hello to every hiker I pass in National Parks, and almost always, they say hello back. On the Bright Angel trail, only half the people responded to my hello. Maybe there were just too many people to say hello to. Could it be my ugly hat turned people off? In general, National Park People said hello, but Theme Park People did not. The trail is a series of switchbacks that descend steeply into the canyon. Most of it is in the sun, with only a few spots of shade. The easy part was going down. What goes down, must come back up. Coming back up was the hard part. We didn’t see the famous mule train as we hiked, but we sure saw, smelled, and had to step around “gifts” the mules left behind. Couldn’t they put diapers on the mules? Two thirds of the way to my (not necessarily Loretta’s) goal – the mile and half rest stop, Loretta started to question if we should continue. I encouraged her to keep going. Five minutes later, a hiker told her it’s just around the bend. That kept her going. The rest shelter was crowded and we struggled to find a place to set down our backpack while we drank some water. We steeled ourselves and headed uphill for the return trip. When we got near the top, Loretta said. “We are there already? That was easier than I thought. Next time, we should go to the three mile rest stop.” I reminded her that next time, we would be older so maybe the mule trip would be the ticket, despite trading sore legs for sore butts. The three mile round trip with 1000 foot elevation change was a great hike, with stunning and ever changing scenery, and just right for us so we can still do other hikes in the afternoon. Grand Canyon looked a bit like Disneyland. The shuttle bus system with its color coded route system, the themed hotels, the ever present gift shops, the tour buses, the train, and the crowds all contribute to a theme park feel, not a tranquil National Park feel, on the South Rim. Most just get off the bus stop at a viewpoint, walk the 50 yards to the rim, and go back to the bus stop for the next viewpoint. The free shuttle bus is a necessary evil to move the masses, and many times, the buses were standing room only and it’s not even peak season! We rode the shuttle bus to Hermit’s Rest, stopped a few times along the way and hiked the flat rim trail between some stops. Each viewpoint is unique yet similar. There were only so many vantage points before they all blended together. Hermit’s Rest had a cabin recreated to resemble a cabin in the 1800s but was built in the 1930s. Other than the cabin and the trail head, there weren’t much to see at Hermit’s Rest. Hopi Point was the best viewpoint along the shuttle route to Hermit’s Rest, with a 270 degree vista that included a view of the river. The Grand Canyon Railway train pulled in at 11:45, after a 2 1/4 hour journey from Williams, AZ. The train is quaint and invoke nostalgia, especially for train lovers. As the trained passed by, we waved at each other. This was a great way to get to the south rim without the hassles of driving or parking. Grand Canyon National Park stretches from Lake Powell to Lake Mead, over 200 river miles. 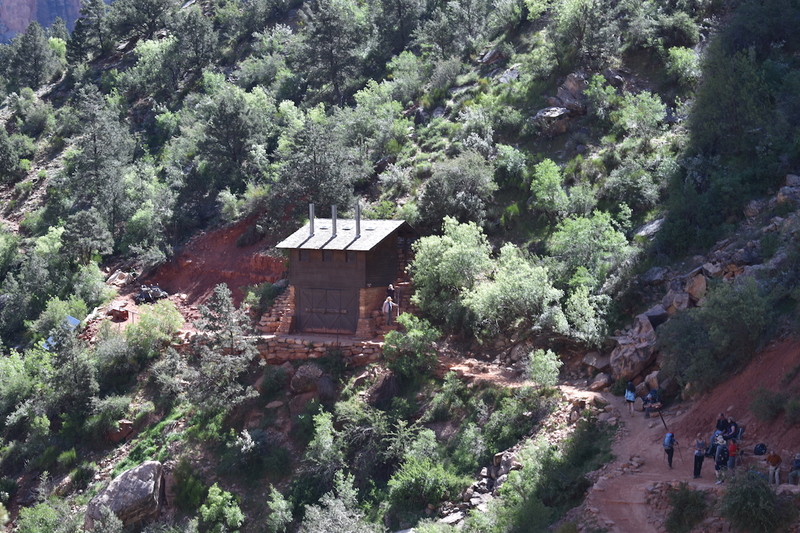 Only a small part of that is accessible by auto/bus, around 32 miles from Desert View to Hermit’s Rest on the south rim. The north rim is even more limited. The single featured attraction (the canyon), and the relatively small area accessible by road, concentrates the crowd that are not easily dispersed. 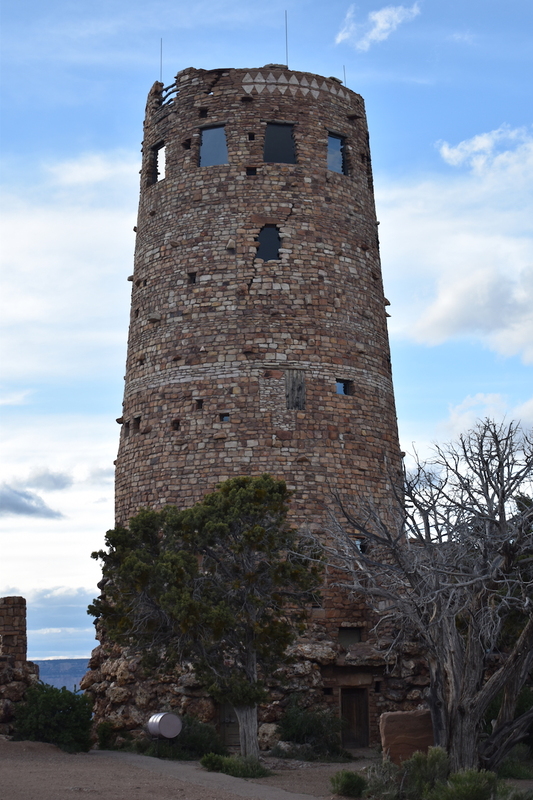 The 25 mile Desert View Drive was less crowded and ends at Desert View, where was a watchtower that looked like an ancient Puebloan stone tower but was constructed in the 1930s with a steel frame. 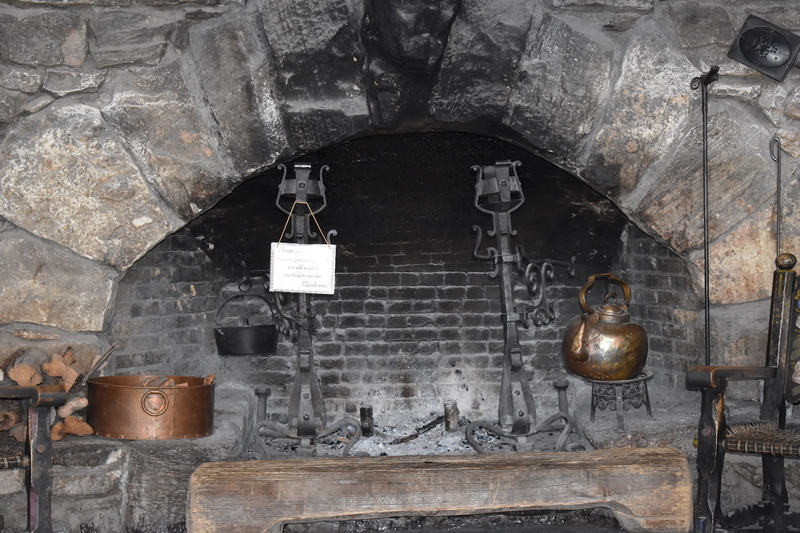 This was the work of Mary Colter, who also designed the cabin at Hermit’s Rest. The many viewpoints along the drive are nice, but not as spectacular as Hermit’s Rest drive. The Desert View viewpoint looks out to the high plateau of Painted Desert and the Grand Escalante National Monument. In the afternoon sun, the red, white and green colors were vibrant and reflected the afternoon sun. To the west, the sun set over the horizon, with the orange ball of fire slowly retreating behind the canyon wall. The after glow lasted for a while, as the canyon fell into darkness and silence. We visited the North Rim in 2001 and it had a completely different feel than the south rim. North rim is 1000 feet higher than the south rim and full of quaking aspen with its signature white bark and tall pines. The crowd was thin, the view of the canyon was just as good as the south rim, and the drive to the rim prettier. I got a better sense of Grand Canyon as it was meant to be – a place of quiet grandeur. These advantages were well worth the extra drive to get there. North rim is only open mid-May to October, so plan accordingly. Take the road less traveled for unique experiences and differentiation, even if it takes more effort, just like the north rim of the grand canyon rewards you with relative solitude and nicer views with the extra effort to get there. Grand Canyon should be on everyone’s bucket list. The massive scale and the ever changing colors are impressive to look at. 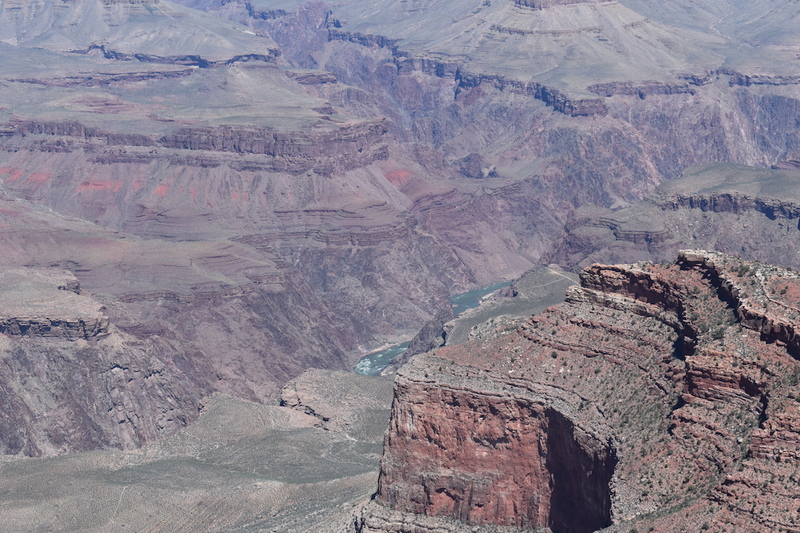 The vast majority of us skips a few breaths the first time we see Grand Canyon. While it’s impressive, this is not the most fun park to visit. The number and variety of trails are limited. The crowd and the infrastructure required to handle the six million visitors makes the south rim feel like a theme park. The haze is worse now than the first time I visited in 1983, ruining the view. The canyon is so big it felt impersonal and surreal, almost like I’m standing in front of a picture. NPS does a decent job of handling the massive amount of people but they can not recreate the feeling of wildness at the developed portions of the south rim. If you are physically able, an overnight hike to Phantom Ranch or a two week rafting trip sound like a great way to see the canyon from a different perspective. The north rim is a better bet for the typical “National Park People”. It offers great views, better trails, and a lot less people. Have you visited Grand Canyon? Leave a comment below on your experience. Click on the Follow link and get an email when new postings are available. I will not share your email so no worries. While it’s nice to stay in the park at the south rim, the town of Tusayan, just outside of the park boundary has good accommodations. The free shuttle bus system connects to Tusayan. No need to drive in. Best Western Premier Grand Canyon Squire Inn is an excellent hotel with a shuttle stop right in front of its door. Study the bus system so you know how to get to where you want to go. The road to Hermit’s Rest has the best views. The shuttle system makes it easy to hike along the route. Food is generally good inside the park. The prices are actually about the same inside the park as it is at Tusayan. 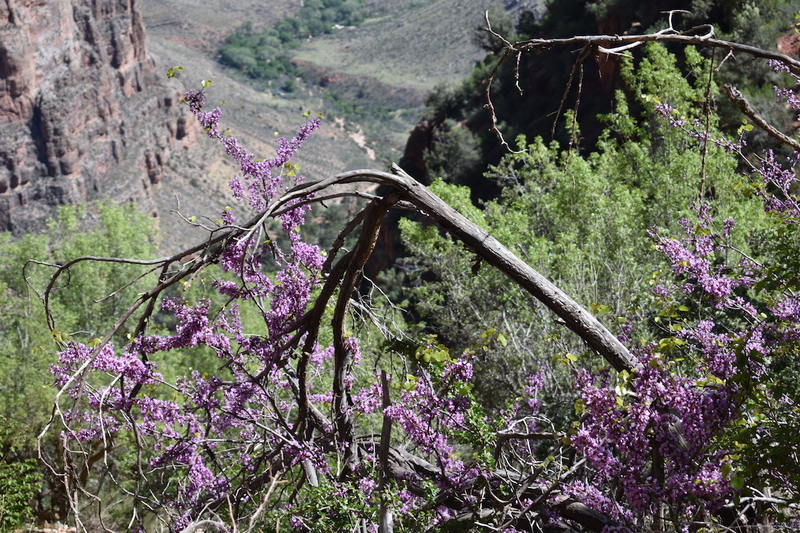 If you want to ride the mule down Bright Angel Trail, plan a year in advance. Same for stays at Phantom Ranch. Reserve well ahead of time for lodging at the north rim. There aren’t good choices outside the park on the north side. Visitors: 5,969,811 in 2016, ranked 2nd. 2016 was a record year.